The heat wave—the worst in at least 140 years in some parts—has left dozens of people dead and pushed thermometers above 40 degrees C (104 F) in at least 40 cities and counties, mostly in the south and east. Authorities for the first time have declared the heat a "level 2" weather emergency— a label normally invoked for typhoons and flooding. "It is just hot! Like in a food steamer!" 17-year-old student Xu Sichen said outside the doors of a shopping mall in the southern financial hub of Shanghai while her friend He Jiali, also 17, complained that her mobile phone had in recent days turned into a "grenade." "I'm so worried that the phone will explode while I'm using it," He said. 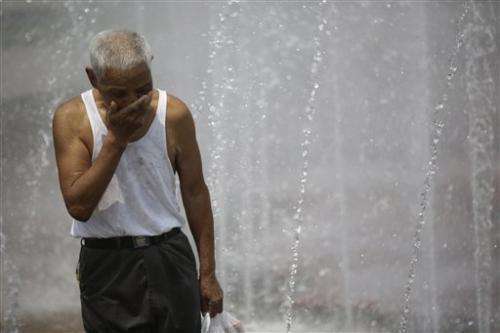 Shanghai set its record high temperature of 40.6 C (105 F) on July 26, and Thursday's heat marked the city's 28th day above 35 C. At least 10 people died of heat stroke in the city over the past month, including a 64-year-old Taiwanese sailor, the official Xinhua News Agency said. Climate scientists usually caution that they can't attribute a single weather event like the Chinese heat wave to man-made global warming. But "human-caused warming sure ups the odds of heat waves like this one," said Jonathan Overpeck of the University of Arizona. The Chinese heat wave "gives a very real face to what global warming is all about," he wrote in an email. "This is the future. Get used to it," Andrew Dressler of Texas A&M University told The Associated Press by email. "You often hear people say, 'Oh, we'll just adapt to the changing climate.' It turns out that that's a lot harder than it sounds, as the people in China are finding out now." Wu Guiyun, 50, who has a part-time job making food deliveries in Shanghai, said she has been trying to linger inside air-conditioned offices for as long as possible whenever she brings in a takeout order. Outside, she said: "It's so hot that I can hardly breathe." 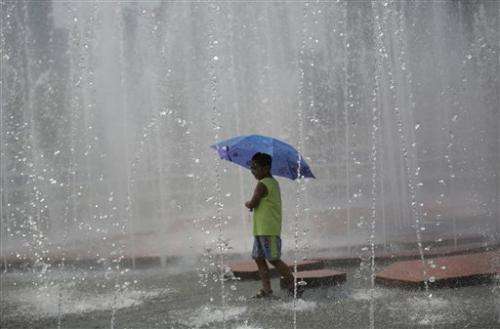 The highest temperature overall was recorded in the eastern city of Fenghua, which recorded its historic high of 42.7 degrees (108.9 F) on July 24. On Tuesday, the director of the China Meteorological Administration activated a "level 2" emergency response to the persistent heat wave. This level requires around-the-clock staffing, the establishment of an emergency command center and frequent briefings. Some Chinese in heat-stricken cities have been cooking shrimps, eggs and bacon in skillets placed directly on manhole covers or on road pavement that has in some cases heated up to 60 degrees C (140 F). In one photo displayed prominently in the China Daily newspaper, a boy tended to shrimps and an egg in a pan over a manhole cover in eastern Chinese city of Jinan. In the port city of Ningbo in Zhejiang province, glass has cracked in the heat, vehicles have self-combusted, and a highway billboard caught fire by itself, sending up black smoke in the air, according to China Central Television. The broadcaster said the heat might have shorted an electrical circuit on the billboard. In the southern province of Hunan, a housewife grabbed several eggs stored at room temperature only to find half-hatched chicks, state media reported. A joke making the rounds: The only difference between me and barbequed meat is a little bit of cumin. And just to think, with more CO2 being dumped into the atmosphere at exponential rates of increase in spite of warning after warning by scientists, and denial after denial by the rightwing, it's going to get even hotter. When it hits 120C in land that is normally deciduous and 90C in the summer, then maybe people will decide it's time to fix global warming. And by that time it will be far too late to do anything but die by the millions. That is the Republican Plan for America. Good God Republicans are so freaking stupid. Very insightful comments from DUMB, DUMBER and DUMBEST. I'm sorry Anti, doesn't 120F sound pleasant enough for you? (I said 120C, Not unless your an extremophile is that even close to fun. I meant 120F. My bad). We must have ticked off the Watts Up crowd. Freakin knuckle draggers from the marsh pits of ignorance. And Howhot wins the prize for DUMBEST. If it's any consolation to DUMB and DUMBER, it was a very close call.